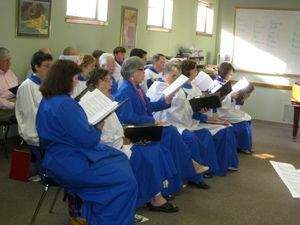 The Emmanuel Choir is the musical backbone of the parish singing for the 10:30 a.m. liturgy each Sunday morning. In addition to their weekly duties, the choir sings for special liturgies throughout the year such as Choral Evensong, Advent Lessons and Carols, and Christmas Eve, Holy Week and Easter. The choral repertoire of the Emmanuel Choir is grounded in the Anglican choral tradition. Our musical offerings span the centuries from 16th century composers, such as Palestrina and Tallis, to 21st century composers, such as John Rutter and Mack Wilberg. Choir rehearsals are held on Wednesday evenings from 7:15 p.m. to 8:45 p.m. We meet again at 9:30 a.m. on Sunday mornings to prepare for the 10:30 a.m. liturgy. Membership in the Emmanuel Choir is open to persons in their teenage years and up. Music reading skills are helpful, but not a requirement to sing in the choir. The ability to match pitch and a joyful spirit are the most important aspects of choir participation. The Emmanuel Choir does not rehearse on Wednesday evenings during the summer months, usually mid-May to Mid-August. However, the choir continues to sing each Sunday morning and persons who do not sing in the choir throughout the year are invited for the summer months. The choir meets at 9:30 a.m. each Sunday during the summer to prepare for the 10:30 a.m. liturgy. To learn more about becoming part of the Emmanuel Choir family, or to learn more about music at Emmanuel, please contact the Director of Music by email or call 706-543-1294 ext 212.